I've never been a big hot chocolate fan. It's too sweet and I can only drink a little bit before I'm ready to dump the rest down the sink. But this year I discovered Starbucks' Dark Chocolate Salted Caramel Hot Cocoa and that stuff is sooooo good. It's the liquid equivalent of Ghiradelli's Dark Sea Salt Caramel Squares and those things are heaven in a wrapper. I can still only drink half my mug, but I actually find myself wanting to make some. Last night we decided to try Dunkin Donut's version. Of course we had to go to Target first because we love the holiday-themed candy (it's the only time we buy any. Then we try a couple pieces of every bag and let the rest sit there forever because we're actually not big candy eaters). We got peppermint M&Ms, Gingerbread Twix, Hot Cocoa with Marshmallow 3 Musketeers, and Candy Cane Junior Mints. I can't believe I didn't know all those things existed until this year. Once we got to the drive-through at Dunkin Donut's we discovered that they were all out of salted caramel hot chocolate AGAIN (and John acted like he was sad about it -- not very convincingly, I thought, but apparently the girl at the window didn't understand he was joking?) so we had to settle for mint hot chocolate. It was actually still pretty good, but I love salted caramel. Hopefully they start ordering more because it sounds like they run out fast every day and I don't want hot chocolate at 6 AM. I insisted that we pour the hot chocolate from the big styrofoam cup into our mugs. 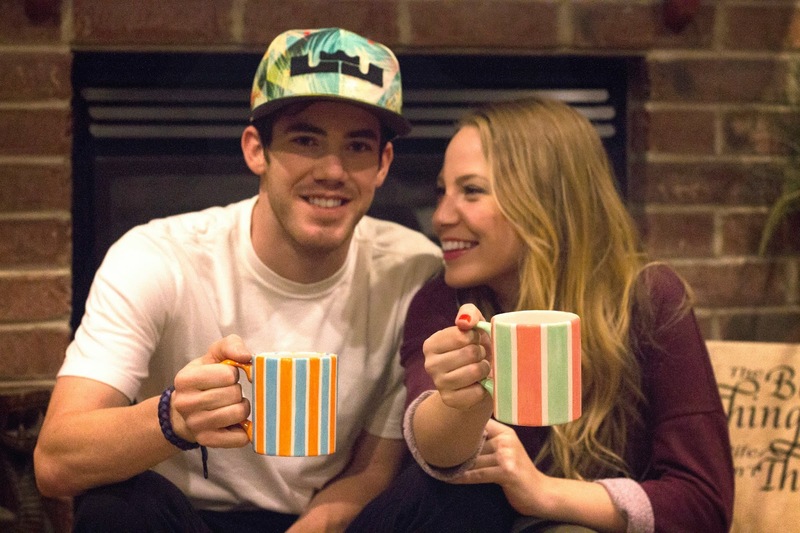 We painted these at Color Me Mine on two different date nights and we couldn't remember how big the stripes on the first mug we made were. So that's why they don't match exactly. We need to make John a new one because he doesn't like the size of stripes or the color of his mug. And then we (I) made my mom take a picture. John actually smiled, which is kind of a big deal for someone that hates loathes despises having his picture taken. I am such a good influence on him.